The photo above shows pages from Reinhart's pop-up book "Harry Potter: A Pop-up Guide to Hogwarts." Reinhart's pop-up books include Frozen, PIXAR Pop-up Celebration, The Nightmare Before Christmas Pop-up, The Avengers, Game of Thrones Pop-up Guide to Westeros, the Star Wars Pop-up Guide to the Galaxy, and more. 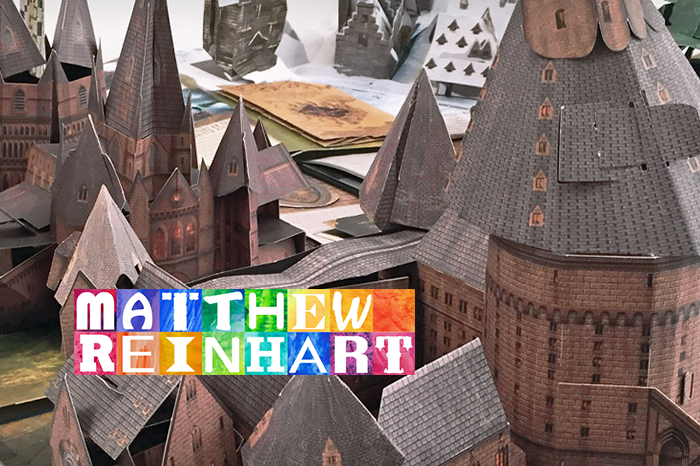 Join award-winning artist Matthew Reinhart as he takes you on the journey of creating his gravity-defying pop-up books. Learn how you can turn your ideas into pop-up reality with simple paper engineering techniques taught by the master himself. Matthew reveals the untapped potential that a single piece of paper can hold with a pop of imagination! The UI Libraries is pleased to present Reinhart (who grew up in Cedar Rapids, IA) and his masterful works as a way to highlight the UI’s ongoing commitment to scholarship and creative work in the book arts. Our Special Collections is home to a rich collection of artists books, and our Preservation & Conservation department is a destination for those deeply invested in the book arts.